For April Fools Day, make your family these "TV Dinner" cupcakes - they'll love them and you'll love making them! Make a batch of cupcakes using paper liners in foil cupcake pans. Here are a few ideas but be creative! Pasta: Tint vanilla frosting with a couple of drops of yellow food coloring. Squeeze strands of pasta from a plastic bag with a small corner snipped off. Partially slice top off white cupcake and "butter" with vanilla frosting colored with yellow food coloring. Sprinkle lightly with green sugar to look like parsley. Frost cupcake green and decorate with green Runts and orange Starbursts cut into quarters. Frost with vanilla frosting that you used for the spaghetti. Stir a small amount of strawberry jelly with red Skittle "cherries" and put on top. Make swirl "crust" with the frosting by squeezing it from a plastic bag with a small corner snipped off. Sprinkle with crushed graham crackers or corn flakes. Frost a cupcake and top with a donut hole. Frost then coat with crushed corn flakes. Make "bone" shape by drizzling melted white chocolate from a plastic bag with a small corner snipped off onto waxed paper and refridgerate until hardened. Frost cupcake generously with vanilla frosting and create a well in the middle. Place a yellow Starburst in the center and spoon caramel ice cream topping over the top for gravy. Frost cupcake with vanilla frosting tinted yellow. Trim yellow parts off of candy corn and place on the top to look like corn kernels. Frost with chocolate frosting and add sprinkles. We are excited to announce that we are a featured website on The Kids Cook Monday, an initiative that encourages families to set aside the first night of every week for cooking and eating together as a family. The Kids Cook Monday provides examples of family friendly recipes and video demonstrations along with a free starter family dinner toolkit - making it easy for families to cook and eat together every Monday. We will be contributing recipes and cooking techniques on a regular basis. Plan a family meal - and cook with your kids! The critical question that every parent of a veggie teen must ask: "Are vegetarian diets safe for kids?" The Los Angeles Times published a nice article called Vegetarian Kids that outlines the changing perspective on kids who follow a vegetarian diet. According to the article, "Based on an exhaustive study review, the American Dietetic Assn. concluded in July in a new position statement that as long as vegetarian diets are planned well, they're safe for people at every stage of life..."
Taking it one step further, the artcle reviewed the potential health benefits for vegetarian children. Just because a meal is technically vegetarian doesn't guarantee that it's good for you. Bottom line: Vegetarian diets can be safe, even healthy for kids with proper information, support, and planning. Meatless meals are generally less expensive, often easy to make, may be better for the environment, and are usually healthier. Those are all nice, but if they don't taste great (or worse yet, if they taste "weird"), the rest won't matter because your family won't buy in. That's why I am doing this Meatless Monday series. I will post a recipe for a meatless meal that is inexpensive, simple, healthy, and that your whole family will love. This first one is straight out of our book, Veggie Teens Cookbook: A Cookbook and Guide for Vegetarian Teenagers. Serve with a colorful Garden Salad and crusty bread. Enjoy! 1. Heat oil in large skillet and sauté onion until soft. 2. Add red pepper, garlic, and bay leaves; sauté 3 minutes. 3. Stir in beans (do not drain) and cook for at least 3 more minutes. 4. Stir in vinegar and add salt and pepper to taste. 5. Discard bay leaves and serve in decorative bowls. Veggie Teens Cookbook Voted Best Book for Teens and Tweens! Exciting news! 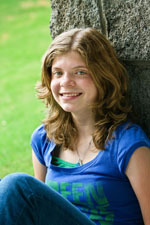 Veggie Teens: A Cookbook and Guide for Vegetarian Teenagers was chosen as one of the 50 Best Books for Teens and Tweens. The good news: A recent study in the Journal of the American Dietetic Association showed that adolescent and young adult vegetarians had healthier intakes of fruits, vegetables, and fat, and were less likely to be overweight or obese. The cautionary tale: The study also found that adolescent and young adult vegetarians were more likely to report binge eating with loss of control and engage in extreme unhealthful weight-control behaviors. The lesson for parents: Ask questions about your teen's reasons for wanting to follow a vegetarian diet (see list). Ask about his or her feelings about his or her weight, body, and eating and watch for signs of eating disorders. If you are at all concerned, seek professional help immediately. The bottom line: A vegetarian diet is a safe and healthful way for teenagers to eat but be on the lookout for signs that your teenager is claiming to be a vegetarian to mask signs of an eating disorder. How do vegetarians handle Thanksgiving? Thanksgiving can be awkward for vegetarians - especially when you're the only one at the table. Our daughter Elyse, 14, is the only vegetarian in our entire extended family—she'll share a meal with 30 carnivores again this Thanksgiving. Remember, Thanksgiving is really not about turkey anyway! Focus on family and friends, not just food - good advice for all of us. Depending on the age of the child or teenager, the parent may want to call ahead and politely ask about the menu. (Elyse's grandmother brought stuffing for Elyse. I love the sign: "Do you know what turkeys are thankful for at Thanksgiving? Vegetarians!" Don't expect the hostess to cook a separate meal but be sure to ask if it's ok if you bring your own entrée. There are great tofu turkey substitutes available now. Don't forget veggie gravy! It can be kind of hectic right before the meal so come prepared with your vegetarian entrée already in a small baking dish, ready to pop in the oven with no fuss. Consider starting a new tradition of having a protein-rich soup or stew made with beans (there are several ideas in Veggie Teens). Serve it in a hollowed out pumpkin, squash or bread bowl. You may want to offer to bring the stuffing so you can make it without chicken broth or sausage. Select from the side dishes but ask whether turkey broth, bacon, lard or other hidden animal products were used. You can also volunteer to bring a great side dish like Lemony Green Beans with Almonds, Glazed Carrots or another vegetarian recipe from Veggie Teens that you know you'll love. If someone is being pushy about eating the turkey or asking rude questions about your choice, politely say something like, "I am responsible for what I put into my body." The most important thing is to treat others with respect and they'll usually do the same. Being vegetarian in a mostly non-vegetarian culture is really a year-round issue. Give your teenager responsibility for what they eat and use it as an opportunity to learn how to handle challenging social situations. What to do when your kid says, "I don't eat meat anymore." Why do you want to be a vegetarian? Are any of your friends vegetarians? Why? Have you done any research yet about being a vegetarian? What have you learned so far? How is that different from being vegan? Do you know what to eat to be sure you’re getting all of your nutrients? Does this decision have anything to do with wanting to lose weight? Are you concerned about what you will eat at school and when you’re with your friends? Will we need to buy or prepare special foods? How will you help us with that? It was clear from her answers that she had really been thinking about it and was serious. As a physician, I wasn't particularly concerned about the health issues because I knew that with a little education and planning it was possible to get the necessary nutrients from a vegetarian diet. However, to be completely honest, we were a little concerned about the inconvenience. Although we probably ate fewer animal products and more plant-based foods than many families, none of the rest of us are vegetarian. We also knew it would be a challenge for her, and frankly, we thought it would probably pass. Owen and I discussed it privately and decided that since we are a family made up of unique individuals, each of us has a right to choose what is best for them as long as it is safe and healthy. Therefore we made the conscious decision to support her fully while giving her the responsibility for learning more about what it really meant to be a vegetarian. We also made it clear that she would have to help us with the practical side of things, including cooking, especially when the rest of us weren’t having a vegetarian meal. Two years later she is as committed as ever and we are very proud of her. I believe her decision will have a positive affect on other aspects of her life. Although she sometimes makes difficult sacrifices, I believe she feels empowered by her ability to take responsibility for what she puts in her body.